Tourists and locals alike can appreciate the rarity of this moment captured in a photo. 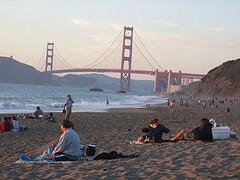 Baker Beach in San Francisco is warm enough for shorts, and the horizon is sufficiently clear to allow a setting sun to cast a warm glow on happy faces. The norm is coastal fog, wind and sub-60 temperatures by this time of day.